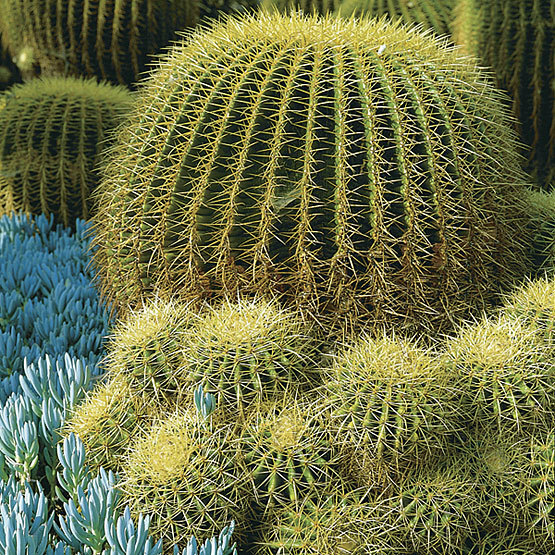 The genus Echinocactus is comprised of 15 or so species of spiny, spherical cacti from scrubland in Mexico and the southwestern U.S. Mature plants flower in summer, showing off rings of bell-shaped yellow, red, pink, or magenta blooms that open during the day. Woolly fruit follows. Grow in a desert garden or warm greenhouse. Noteworthy CharacteristicsRound and heavily spined. Slow growers. Some are native to the southwestern U.S.
CareGrow in full sun and fertile, well-drained soil. Indoors, grow in full light and keep dry from early autumn through early spring. PropagationStart seeds indoors in spring at 70°F. ProblemsYoung plants are often affected by basal stem rot, soft rot, and mealy bugs.